It’s been a very difficult and stressful time, and NQAPIA is doing our best to support our community with love, resources, training, and support. We want to share a little update about everything that we have accomplished over the past 6 months since Trump took office, thanks to the support of countless donors. Immediately after the election, we knew that we needed to support our community in taking action and learning how to organize as strategically, powerfully, and safely as possible. Sasha, NQAPIA’s Organizing Director, with the support of Tia, NQAPIA’s Program Assistant, ran direct action trainings in 8 cities over 5 weeks for people of color. We centered APIs in these trainings and also reached out to Black, Latinx, and Native American communities. When we first announced the trainings, they were shared hundreds of times, reaching over 3,000 people in just 24 hours. 40 people had never been to an action before, and those who did said they feel better prepared and know how to watch out for their safety. Two young people took a bus for 6 hours from a rural community to attend the training. Our youngest trainee was just 19-years-old and showed how young people are taking leadership and training others. After one training, people formed a safety team for the National Day of Action for Trans Women of Color. NQAPIA’s staff has been working hard to protest President Trump’s anti-Muslim and anti-refugee travel ban. As soon as his Executive Orders came out, NQAPIA mobilized LGBTQ Asians to attend airport rallies in Los Angeles (LAX) and Chicago (ORD). In New York (JFK), NQAPIA provided legal advice to LGBTQ Muslims and allies who were caught up in the ban. After the second Muslim ban came out, NQAPIA joined the legal challenge and filed an LGBTQ amicus brief in the U.S. Court of Appeals for the Ninth Circuit (bit.ly/hawaiivtrump). NQAPIA, along with the NYC Gay & Lesbian Anti Violence Project and Immigration Equality, with the pro bono assistance of Skadden Arps LLP, urged the appeals court to uphold a lower judge’s order to suspend the travel ban. Our brief Hawaii v. Trump illustrated the impact of Trump’s Executive Orders on the LGBTQ community and shows how it tears LGBTQ families apart. NQAPIA’s Southern Regional Leadership Summit brought together nearly 40 leaders of LGBTQ Asian and South Asian organizations in North Carolina, Georgia, Virginia, Louisiana, and Texas in May. We built new relationships with queer South Asian groups in Houston and Austin. The leadership trainings and capacity building workshops helped local LGBTQ API groups, so their work is better organized, more impactful, more inclusive, and has greater reach. Following the lead of CHAA, a local LGBTQ API organization in Houston, we took action on Texas State Bill (SB) 4 which bans sanctuary cities and allows racial profiling of immigrants. By the time we convened for the Summit, the legislature had already passed the bill. 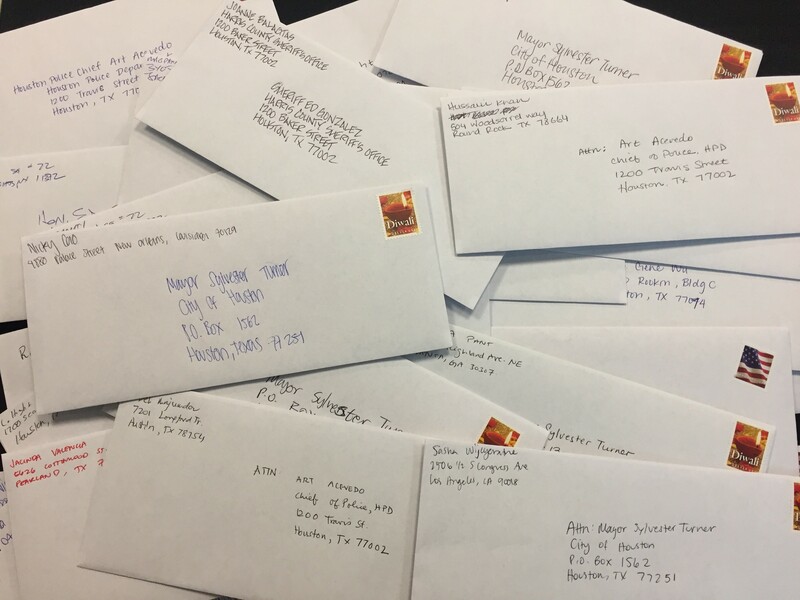 So, attendees hand wrote letters to the Houston Mayor, Harris County Sherriff, Houston Police Chief, and City Councilmember urging them to sue the state to block the law from taking effect – mitigating the implementation – and thanking them for taking a stand against SB4. We wrote over 50 letters. Your donations paid for the stamps and the paper! More Regional Summits are planned for the Midwest in Chicago in early August, West Coast in Fresno in late August, and Northeast in Boston in September. The country is so divided, but NQAPIA’s team of Asian parents who love their LGBTQ kids are bring people together and changing hearts and minds to build acceptance for our community. Chicago – After Valentine’s Day, we launched our Midwest campaign in conjunction with i2i and Trikone-Chicago. The PSA videos co-produced by the Asian Pride Project ran for the first time on major Asian television networks in the Greater Chicago Area in February. They aired 113 times in Mandarin, Cantonese, Tagalog (Filipino) and Hindi reaching 53,406 Asian households each time for a total of six (6) million media impressions. Tokyo – LGBT Youth Japan, Rainbow Families, and the Diversity Center at Waseda University invited NQAPIA to give a series of family acceptance workshops in Tokyo. Two dozen young people and parents came to the Shibua Cultural Center to hear mothers Aya Yabe and Marsha Aizumi tell their stories. They gave another talk for 65 students, administrators, and community members at Waseda. One young person rode the train for seven (7) hours just to meet a loving mother of a queer kid. Honolulu – NQAPIA also partnered with the Hawaii LGBT Legacy Foundation and LGBTQ+ Center at the University of Hawai’i at Mānoa for a family acceptance workshop at the LGBT Center Waikiki. We featured our first Pacific Islander parent in our speakers bureau–Noralynn Mae Samalaulu Schubert, a local mom of Samoan heritage. Nearly 30 people came including 20 parents and several fathers. One couple broke down in tears because their daughter had just come out to them as lesbian, and they did know what to do. The workshop was so needed. Since the election, NQAPIA has maintained a legal referral program to provide LGBTQ APIs with access to free (pro bono) legal advice on immigration law, criminal justice, transgender rights, and LGBTQ family law. We launched this effort because we discovered that many legal services providers were not culturally competent, did not speak an Asian language or dialect, or were outright hostile towards LGBTQ people. Since the inauguration, intake calls to our referral program have skyrocketed, and we have been working hard to help keep every person safe. People donated as little as $5 and as much as $5,000, raising over $30,000, so NQAPIA could have the resources to support all of our work for the community. All this was made possible because of your support and donation. Thank you so very much!